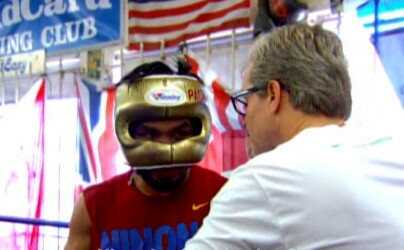 Is Pacquiao afraid to fight Marquez again? By Chris Williams: Now that Miguel Cotto has opted not to fight Manny Pacquiao again due to weight issues, among other things, it’s more than a little strange that Pacquiao and his promoter Bob Arum haven’t quickly selected Juan Manuel Marquez to fight next in December. That’s really their only choice if they’re interested in getting a big pay per view fight. The option is Tim Bradley, who already beat Pacquiao last June in a fight that brought in less than spectacular PPV figures. If you’re like a lot of people you’ve got to be wondering why Pacquiao isn’t automatically picking Marquez to fight in December. Is Pacquiao worried that he may lose the fight and end up missing out on his big payday fight against Floyd Mayweather Jr next year? If that’s the case then I can’t blame him. If I was in Pacquiao’s boat and I was starting to show signs of decline in losing to someone like Bradley, I’d tell my promoter to go fly a kite if he asked me to pick between Marquez and Bradley. I wouldn’t do, not with a big money fight against Mayweather just beyond the horizon. That’s not smart. I would be afraid, yes. If In was at the top my game I’d feel a little better, but even Pacquiao at his best really never showed that he was the better fighter than Marquez in their three previous fights. But now that Pacquiao’s skills are starting to decline, he’d be making a big mistake if he chooses one of Arum’s options for his next fight. Those aren’t the kinds of fighters you take on when you’re looking at a big money fight against Mayweather. Pacquiao should be taking on guys that are a step down from those two fighters, someone like Selcuk Aydin in a stay busy fight. I’m sure Arum might not be pleased because it would mean less money but it’s the safe pick and the smart choice. Arum is putting Pacquiao in a risky situation where he could lose millions if he takes on the dangerous Marquez and gets beat. The Mayweather would be impossible to put together at that point without Pacquiao having to take a really tiny share. Pacquiao’s bargaining position for a Mayweather fight might be better if he were to fight Marquez now and decisively beating him, but I don’t think he can do it and the risk is too high that something will go wrong again. Additionally, there’s a high chance that Pacquiao will suffer a bad cut in the Marquez fight and that in turn will delay a Mayweather fight. Pacquiao should just say no to Marquez or Bradley, and instead take on an easy slugger with only one gear that he can whip on. Boxing » Juan Manuel Marquez » Is Pacquiao afraid to fight Marquez again?